The plan for the narrow L-shaped layout is located on the top floor within the landmark, century-old Dearborn Station. 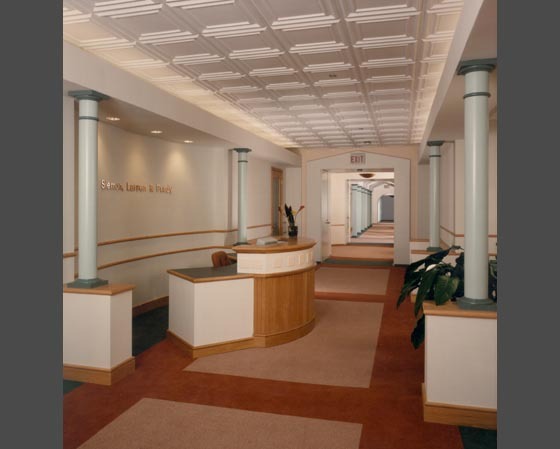 It houses attorney offices, conference rooms, and law libraries along a 120-foot circulation corridor. The long corridor was planned with special ‘events’ along its length. The ambience of the former train station is expressed through a sequence of areas along the corridor punctuated at midpoint by the station’s monumental stair and clock tower. The south wing contains a staff lounge and roof terrace plus the central copy, file and other support areas.